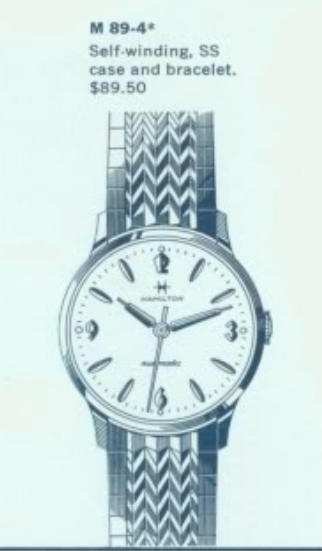 There were 12 M-series watches in Hamilton's 1964 lineup. Conventional wisdom is the M-series (and F-series of ladies models) were marketed through a special channel, like a nation-wide chain store. The line was produced from 1961 through 1967, or thereabouts. The models are known by their price and the sequential order. The fourth model to be priced at $89 was the 1964 M 89-4. The M 89-4 came in a stainless steel case with a white dial and a matching bracelet. I recently picked up an M 89-4 and it's the fifteenth M-series model I've laid hands on. It arrived in decent shape, just a little banged up on the crystal and a smudge on the dial near the 7 marker. The stainless steel case is a typical one-piece design so the watch opens through the crystal. Inside is a Hamilton 689 17 jewel automatic movement. The ETA automatics of the 1960's are all very similar and once you get practiced at taking apart one of them you can pretty much tackle any of them. Shown below are the parts after being cleaned and dried. Without the rotor not installed yet, the movement looks like a garden variety manual winding movement. All that's needed now is the balance. I like to put the balance on after putting some tension into the mainspring - that way the watch will start running if everything is in order. As you can see below, the balance is spinning away briskly so it's off to the timer next. Well, something inside is making a little extra noise, probably a microscopic piece of lint on the hairspring. It doesn't take much to through off the watch's timing. That's better, now it's just a matter of tweaking the regulator to bring the timing in line. The rotor assembly goes on, along with the dial and then I can drop it back into the case. A new crystal will do a lot to improve the looks of the watch. 30.6mm will do the job nicely. The hour and minute hands are pressed on at 12:00 so they'll be synchronized. It doesn't really matter where the second hand goes, it's driven separately from the other hands. And here's the finished watch on a fresh strap. Other than the small scrape on the dial, I think it looks almost new.